In Outlook 2016 for Windows, "Clutter" can help you filter low-priority email, saving time for your most important messages. If Clutter isn't for you, you can Turn it off. The email server keeps track of the email you read and the ones you don't. Once you turn it on, Clutter is automatic. As new email comes in, it takes messages you're most likely to ignore and puts them into the "Clutter" folder. 1. 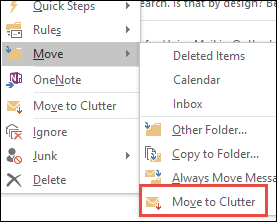 In Outlook, choose the Clutter folder. You'll see your email there. 2. You can drag email from your Clutter folder to your Inbox. 3. Moving an email in or out of the Clutter folder from any of your devices is enough to give the signal to the Clutter system that an item is or isn't Clutter. 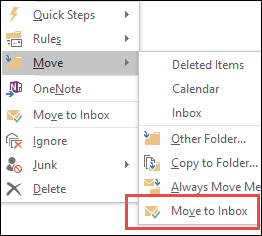 For example, if you move an email to the Clutter folder in Outlook desktop or to the Mail app on your phone, the Clutter system records the action for all your mail apps. You don't have to do this individually in each app. 1. 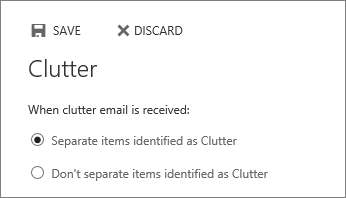 If you have Outlook 2016 for Windows, right-click the Clutter folder and choose Manage Clutter. You'll be directed to Outlook on the web. 2. Sign in using your Office 365 user ID and password. You'll then go directly to the Clutter settings page. It might take Clutter a few days to fully adapt to your preferences as the system records your choices and uses the information to identify similar messages in the future. But you can help Clutter learn your choices faster by performing some simple actions. · If you see a low-priority email in your Inbox, right-click the message and choose Move to Clutter, or drag the email from your Inbox and drop it into the Clutter folder. · If you see a message that was sent to Clutter by mistake, right-click the message and choose Move to inbox, or drag the email from the Clutter folder and drop it in your Inbox. Clutter and junk email are filtered out before they reach your Inbox. Junk email is evaluated and filtered first, then Outlook processes the rules (if you've set up any). Next, based on your past behavior, Clutter analyzes the remaining messages and filters out the types of messages that you usually ignore or don't respond to. You need to turn on Clutter in Outlook on the web so that you can use it both in Outlook on the web and Outlook. 1. Sign in to Outlook on the web. For help, see Sign in to Outlook on the web. NOTE: You can't turn on Clutter in the light version of Outlook on the web. 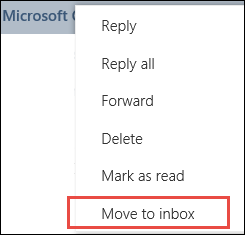 You can switch, however, to the full version by navigating to Options > General > Light version and clear the Use the light version of Outlook on the web check box. 2. In the upper-left corner of the page, choose App launcher > Mail. 3. On the navigation bar, go to Settings > Options > Mail > Automatic processing > Clutter. 4. Choose Separate items identified as Clutter > Save . · You can turn off Clutter anytime by selecting Don't separate items identified as Clutter. 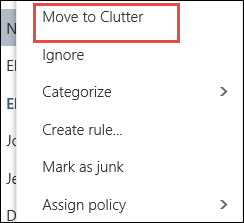 · The Clutter folder remains in Outlook even after you turn off the feature. IMPORTANT: If you bought Office 2016 for Windows as a one-time purchase, and you don’t have an Office 365 subscription, you won’t have access to some features, such as Clutter. Going forward, there will be regular updates with new features where you’ll need to have an Office 365 subscription to use them.